What Services Does Wizcrete Provide? We are licensed General Concreters (Lic No 173183c) and specialize in all concrete works including resurfacing and hard landscaping. Could one question be all that’s between you and a beautiful home? 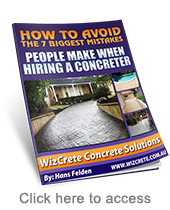 Still got some questions about “Wizcrete Concrete Solutions”? What is the “Wizcrete Concrete Solution”? What warranty do you give on your products? How thick is the re-sprayed concrete surface? How soon can I use the new surface? Can you apply the “Wizcrete Concrete Solution” over painted concrete? Are the new concrete surfaces easy to keep clean? Can you correct drainage or low spots? How do you treat cracks in the concrete prior to the spray-on application? Will existing cracks in the concrete re-occur? Can the “Wizcrete Concrete Solution” be used on steps? Can the “Wizcrete Concrete Solution” be used over pebblecrete and tiles? What if I only want a very small area decorated with spray on paving? Can you still put spray on paving over cracked concrete? What if my concrete already has paving paint or sealer applied to it? Can decorative concrete resurfacing be used as a non-slip application? How often do I need to re-seal the decorative surface? Our “Wizcrete” concrete coating is a cement based polymer enhanced coating that has been specially designed and formulated to be applied to the surface of existing concrete or pebblecrete. The concrete is a strong durable spray-on product that can simulate up to 35 exciting patterns such as the traditional Cobblestone and Terracotta Tile. Our coatings have a myriad of applications such as driveways, terraces, carports, pathways, entranceways, entertainment areas, pool surrounds etc. Custom designed logos and motifs can also be created. For best results, the existing concrete surface must be of sound or solid condition. Our “Wizcrete Concrete Solutions” coating has been independently tested by the CSIRO. The results indicate that if the spray on coating is applied in accordance with the manufacturer’s specifications, a service life in excess of 15 years may be expected. “Wizcrete Concrete Solutions” offers a 5 year warranty on the product when used in domestic situations against fading and peeling subject to the recommended resealing process. The spray on concrete solution applied onto old concrete and is between 3mm to 4mm so it won’t impede doorways. “Wizcrete” has a selection of over 28 standard colours to choose when combined in a textured coat this will provide a wide variety of colour options. An average job will take 2 to 4 days. Larger more complex jobs may take longer. Clean foot traffic is usually allowed on the same day. Vehicular traffic or strong washing and scrubbing are not recommended for seven days. Yes, by scarifying or shot blasting the surface we can remove the paint to achieve an adequate bond. Yes. Usually, normal washing with a hose is all that is needed. Mould, mildew, motor oil, etc. can be sprayed off with a garden hose. Generally, drainage can be improved. The degree of success is contingent upon the pitch of the concrete adjacent to the low spot. Your “Wizcrete” authorised representative will be able to advise you of the possible outcomes once they’ve seen your place. Cracks are ground out with a grinder to produce a “V”. A two-part epoxy is introduced to re-bond the crack. Though everything possible is done to treat cracks and eliminate them, external conditions may cause them to reoccur. Proper placement of tension cuts greatly reduces the chance of the crack returning. Yes, it can be applied to concrete steps including risers and treads. Yes, but careful inspection is required to ensure that the surface is sound. If the pebblecrete is sound the “Wizcrete Concrete Solution” can be applied directly after normal preparation. For glazed tiles grinding is normally required prior to application to ensure that a correct bond is achieved. Generally, the cost starts at just $48/m2. It means the average 70/m2 driveway cost will start at around $3,360 depending on the condition and geography of your driveway. Compare that to the average $11,000 cost of ripping up and replacing your driveway and you’ll see it’s a very economical option. Small jobs are no problem however, there is a minimum charge of $2,500 for small jobs. Yes, the cracks can be repaired. However, it can’t be guaranteed that the cracks won’t return. If the cracking is severe then that section of concrete will need to be removed and a new section laid prior to resurfacing. The surface will need grinding so that only clean concrete is left. It will cost more if the surface needs grinding to remove old sealer or concrete paint. It certainly can be applied as a non-slip coating. It’s ideal for decorative resurfacing around slippery areas such as swimming pools, wheelchair ramps, or anywhere where there is a risk of slipping on concrete. Your Wizcrete concrete coating should be resealed every 24-36 months with an approved high-quality sealer. The cost for this service is around $650 for the average driveway. What Kind of Guarantee Do We Offer? be carried out every 2 years and we’ll honour this iron-clad guarantee.